NEXCOM's Control Panel PC Solution facilitates control and adaptability of tube cutting machines to handle stainless steel tubes improving speed, quality, and productivity for the manufacturer. Consisting of NEXCOM's Control Panel PC APPC 1533T, CODESYS Control SoftMotion CNC RTE and TargetVisu software, and EtherCAT support, NEXCOM's all-in-one PC-based solution for control and HMI accomplishes a rapid synchronization between cutting arms to achieve smoother sections in tubes and pipes and fits different shapes with simplified system programming to serve different clients. 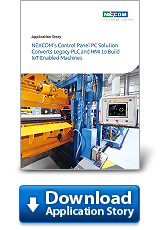 By replacing the legacy PLC and HMI system, the solution streamlines the machine structure with cost benefits and makes future IoT applications possible. Tube cutting machines use two blades programmed to move simultaneously around tubes or pipes of larger diameters to create faster cuts. In this application, the machine is programmed to cut a specified hollow section of the tubes producing burr-free edges at a speed that minimizes cutting time. However, the client's previous machines working at a regular speed controlled by micro PLC modules on servo drive with SoftMotion software and CTNet communication protocol resulted in asynchronous commands to both cutting arms, causing asymmetrical cuts, rough edges, waste of product, and unpredicted collisions. The manufacturer's machines were confined to work much slower than expected to diminish casualties, limiting the productivity and affecting the quality of the outcome. Moreover, the machines required strenuous efforts on programming when a new cutting path was on demand. For these reasons, they needed a solution to boost productivity by improving operation to meet dissimilar clients' orders in a shorter period of time and were introduced to NEXCOM's EtherCAT-enabled Control Panel PC Solution through Onx Control Systems. The EtherCAT-enabled Control Panel PC Solution is used to control and display operational information in order to deliver an enhanced tube cutting machine. The APPC 1533T holds the tube with the hydraulic clamps and with a conveyor-like mechanism positioning it where a pair of blades move around following a path to create a clean cut. The high computing capabilities of NEXCOM's solution with CODESYS Control SoftMotion CNC RTE software controls both cutting arms by calculating positions and reaching servo drives faster than the previous system, bringing a speedier synchronization between cutting arms for smoother cuts and increased productivity. Additionally, real-time information such as length, diameter and hollow section of the tubes, as well as indicators of the blades rotation speed and cutting path is seamlessly displayed from beginning to end on the 15-inch touchscreen panel of the APPC 1533T with CODESYS TargetVisu. Manufacturers can expand their business opportunities addressing a variety of client's orders at a fraction of the time while avoiding programming efforts thanks to the APPC 1533T loaded with more operation modes compared to the limited storage capacity in micro PLCs. The Control Panel PC Solution helps manufacturers to attain a faster and more versatile tube cutting machine. In order to perform an improved control, EtherCAT communication protocol delivers commands swiftly to achieve unparalleled synchronization between cutting arms. High computing power plays an important role not only by performing calculations faster, but also displaying all the required data in real time to monitor the entire cutting procedure. In addition, the PC-based nature of the solution offers expandable storage capacity to hold more data while incurring less programming efforts. Ultimately, operating costs are trimmed down since smoother cuts extend blade's service life, the deburring step can be eliminated, chamfering tools last longer, and the products hit the market faster. Looking forward to the Industry 4.0 era, NEXCOM's solution equips the cutting machine with IoT connectivity and architecture flexibility for future smart manufacturing applications. The machine can connect to, for example, manufacturing execution system (MES) and cloud dashboard, so production statistics, work-in-progress, and manufacturing information on a factory floor can be tracked locally and remotely in real time. Machine-to-machine communication can also be set up for factory-wide system integration.